Extremely soft cream, specifically designed for professional body massage. Its highly emollient structure makes it possible to perform any massage technique. 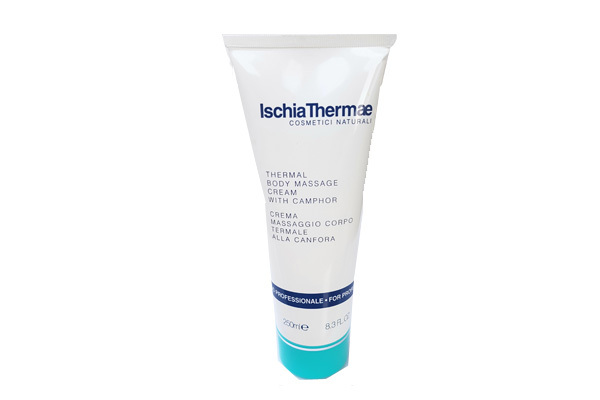 The Ischia Thermae thermal water-based formulation and natural plant components, among which the Camphor, allows during the massage to perform a particularly remineralizing action of the skin on the surface and clear. The cream is therefore ideal for a relaxing massage and especially for a rejuvenating massage. The latter is especially useful for those who, although not having particular blemishes, lead a decently sedentary life and need to stimulate the body, free the body from accumulated toxins, maintain a slim line, restore skin elasticity and brightness preventing relaxation of the tissues. The product is perfectly absorbed by the skin that after massage, has no traces of greens and looks elastic, fresh and velvety.